Depending on your point of view, James Horner: The Classics is going to annoy you or you're going to totally embrace it. 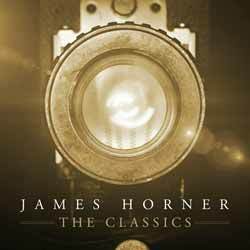 Firstly, it's not just a compilation album of some of Horner's most memorable themes presented as authentically as the originals. What we have here are 14 tracks (1 hr, 04 min, 11 sec) that have been reworked to showcase the playing of well known, in their field, artists. Tina Guo's violin-based 'Theme' from Cocoon is one of the highlights, even if it's not a truly authentic representation of the original. And while Amy Dickson does a remarkable job of bringing the saxophone to 'Willow's Theme' from Willow - something that you'd think was next to impossible - I can see it will annoy a lot of people. The trouble with this album is that the producers can't seem to decide whether this is supposed to be an album of faithfully reproduced recordings with guest artists, or tracks where the artist is allowed a little freedom. As I mentioned before 'Willow's Theme' really strives out to be a little different, whereas 'Main Title' from Star Trek II: The Wrath of Khan and 'Main Title' from Apollo 13 sees trumpeter David Elton present an almost flawless carbon copy of the original (albeit with the mix presented to push his playing to the forefront). 'Boys Playing Airplanes' from The Boy in the Striped Pyjamas sees pianist Alexis Ffrench put his own spin on the original. Still as moving as the original, but with a few extra touches here and there, which adds greatly to the overall recording. If you're a fan of Horner's music and don't just want another collection of faithful performances of his themes then you'll find much to enjoy here.